Ethan Wate has been having strange dreams lately, but he doesn’t suspect how real they’re about to become with the arrival of Lena Duchannes to the small town of Gatlin, South Carolina. Lena comes from a family of powerful magic users, a family that also carries a dark curse with it. Despite how quickly Lena becomes the target of gossip among the Gatlin locals, both for her appearance and her family connections, Ethan finds himself intrigued by her. As Ethan and Lena are about to discover together, Gatlin is a town steeped in magic and secrets, and their two families have been forever linked by both. Whenever I set my eyes on books that are of considerable girth like Beautiful Creatures is, the question that springs to my mind is, are all those pages justified? If I’m about to invest my time in a nearly 600 page tome, I expect to be entertained from start to finish. The verdict on Beautiful Creatures? It was worth a read, but there were quite a few lulls that made me wish the book were shorter by several chapters. I liked the book’s take on magic. Its users are called Casters here, and Lena is one of them. On her sixteenth birthday, she’ll either be Claimed for the Light or for the Dark. Thanks to a curse placed on her family during the Civil War, Lena fears that she’ll be Claimed for the Dark. Lena got on my nerves quite often. I mean, I did feel sorry for her because all she wanted was to be able to attend school and be a normal teenager, but the citizens of Gatlin were determined to make life hell for her. I did, however, think that she spent way too much time brooding over her impending birthday. She could have made better use of her time trying to find a way to avoid turning Dark. Instead, Lena mopes a lot while Ethan does all of the work, poring over books from the Caster Library (which sounds like an amazing place) in search of a solution. Ethan, our narrator, was an all-around good guy, though perhaps a tad too perfect a hero for my tastes. I prefer protagonists who show some flaws, and Ethan is more of the knight in shining armor type. Really, his only flaw is allowing Miss Mopey to carry on with her pity party instead of telling her to snap out of it and lend a hand in saving herself. I’m sorry, but Lena’s attitude seriously annoyed me. I found some of the secondary characters better drawn than the main ones. Ethan’s great aunts, collectively called the Sisters, were a riot. I also liked Amma, the Wate family’s housekeeper, who’s pretty much become a parent to Ethan since his mother died and his grief-stricken father sank into a deep depression. But my favorite character in the novel by far was Lena’s uncle, Macon Ravenwood. He’s just incredibly cool and mysterious and has this presence that commands your attention. Nobody crashes a school board meeting like Uncle Macon does. The novel has a wonderfully eerie vibe to it. You know that something sinister is lurking under the idyllic portrait of small town life that Gatlin goes to painstaking lengths to display. The book’s tone reeled me in from the start, but the same emphasis on how a small town can hide big secrets also hindered the book. It’s very firmly established in the beginning of the novel that Gatlin is the kind of place where everyone knows each other’s business and outsiders aren’t exactly welcome. Small town with small-minded citizens—got it. No need to reinforce this idea over and over and over again. This repetition, combined with the seemingly interminable countdown to Lena’s birthday and the book’s length, caused me to lose some of my interest in the story about halfway through the novel. 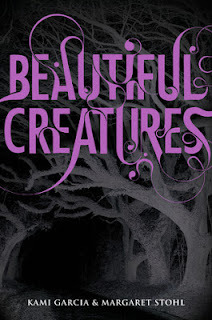 I feel like I’ve been rather critical here, and Beautiful Creatures really isn’t a bad read at all. It definitely has its moments and some intriguing characters. The catch is, though, you have to wade through pages and pages to reach the next interesting bit. That was my experience, at least. Every time I gathered some reading momentum, I’d hit a slow stretch in the story, which I think could have benefitted from some reining in. 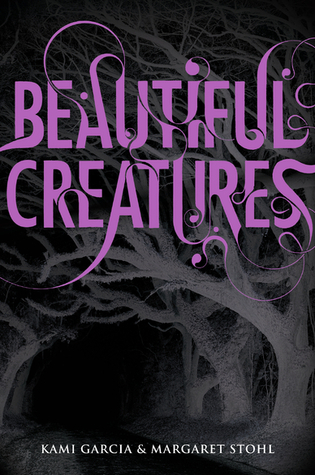 Although I wouldn’t call Beautiful Creatures a page turner, it didn’t bore me to the point where I wanted to abandon reading it, either. I’m not always the most patient reader, and I do believe you need to be reasonably patient with this book, so that was probably a contributing factor in my overall enjoyment of the novel. It wasn't until I was in the bookstore a few weeks ago that I realized how truly LONG the books in this series are. I'd been debating on picking it up, but I wasn't sure I wanted to invest all that time in a book I wasn't sure I really wanted to read. Lena and Ethan don't sound like they'd be big hits with me, but I do like the sound of the unique take in magic and the atmospheric tone the novel has. I'm debating myself whether or not I want to continue with the series. The length of the books is definitely an issue for me, and I didn't feel all that invested in Ethan and Lena's characters. Other aspects of the novel did interest me enough to make me consider trying the second book, though I'm not running out any time soon to get it from the library. This book was too long.. 600 pages!!! I am not going to continue in the series myself. Though I enjoyed this book I just never felt a real connection to find out what happens in the end of the series. The story could have used some streamlining, that's for sure. If I'm in the mood one day, I might try Book 2, though I definitely couldn't read the rest of the series back-to-back. I was quite into the book at first, but then as I saw that so little time was passing from chapter to chapter, I started getting impatient. I was interested enough to keep reading, but the wait between significant events could be very long at times. I have been trying to decide if I want to start reading these books. I know the movie is coming out soon, and I always read the books BEFORE i see the movies... but really, I just cant start a long book right now! I like reading the book before seeing the movie, too. The biggest sacrilege I ever committed was seeing Harry Potter and the Sorcerer's Stone before reading the HP books. Needless to say, I ran out and bought all of the HP books immediately afterwards! This is really balanced review..I had more problems with it's themes but I think it has some great elements to it! I felt like the basic story was solid, but it was surrounded by layers of material that could have been pared down. I think I'll find more enjoyment from the novel than I did with the film as it seems a little more 'in depth' but Lena still sounds annoying in her mopey mood. Fabulous review though. I loved the take from both sides and all the different elements you looked at, particularly with the characters as they are my favourite part of the book.